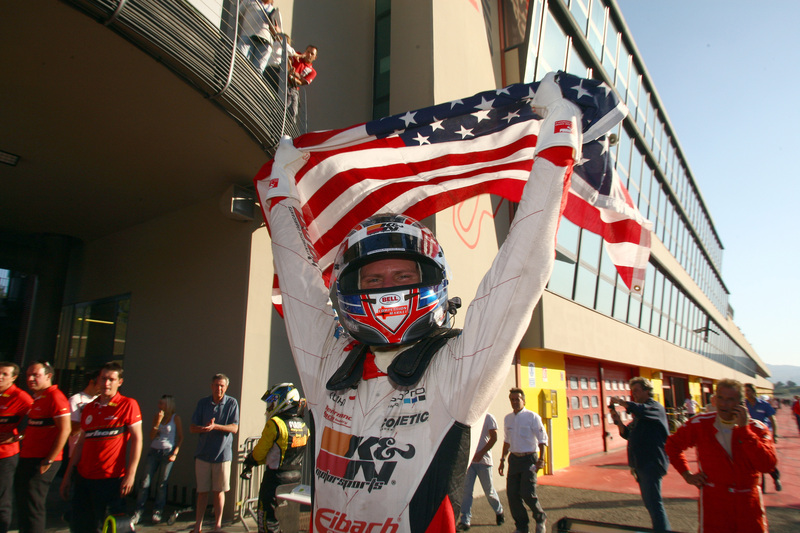 01/10/2011 - A thrilling recovery from the third spot of the grid followed by a good managment of the lead awarded Michael Lewis with the victory in race one of the seventh and penultimate round of the Italian Formula 3 Championship at Mugello. After Facu Regalia's stop (Team Ghinzani) during lap seven, despite he held the lead until that point, the Californian driving for Prema Powerteam first got back on to Edoardo Liberati who inherited the lead left by the team mate, then he kept his slipstream for five laps and with four laps to go he made the successful move and pulled away. Behind them, the Brazilian Victor Guerin (Lucidi Motors) obtained the third step of the podium after a strong overtaking manoeuvre allowing him to get back the third place that he initially lost to Sergio Campana (BVM-Target). The driver from Modena, in turn, managed to keep the championship lead thanks to the fourth place and now stands at 121 points, 14 clear of Lewis and 19 of Liberati, with the latter back in the title fight. Just a point short of the Roman driver is Raffaele Marciello (Prema Powerteam) who, after a strong start of the race when he managed to climb up to the third place, slipped down into sixth at the back of Eddie Cheever (Lucidi Motors) but ahead of Maxime Jousse (BVM-Target) and Simone Iaquinta (JD Motorsport) with the latter ending eighth after starting from the thirteenth place of the grid. Edoardo Bacci (LineRace-CO2) celebrated his debut in the category with the tenth place, behind Brandon Maisano (BVM-Target). At the start, Regalia managed to keep the lead to Liberati but the fight is at their back with Marciello going wide on the grass but not managing to to overtake Lewis who keeped the third position ahead of Guerin, with the latter forced to give away the fourth place to Campana author of a great start. Cheever was in sixth and leaded Marciello, Maisano, Giovesi, Jousse, Vecchi, Roda, Bacci and Iaquinta. At lap three, at San Donato corner Guerin attacked Campana and overtook him, Cheever and Marciello moved to the slipstream of the Modenese, meanwhile at the lead of the race Regalia pulled away. The fourth lap witnessed the first classification moves with Vecchi forced to the retirement giving away the eleventh position, while Giovesi and Roda had to go through the pits for a drive through penalty due to jump start, then Jousse overtook Maisano. The most important twist was at lap seven when Regalia spun and managed to get back on track in the last position before stopping in the pits. The first position passed into Liberati's hands who had to watch out for a Lewis getting closer and closer. The gap is thinning and thinning and at lap ten the Californian was in the slipstream of the Team Ghinzani's car. The leading couple was packed in a few metres while Simone Iaquinta produced a good recovery started from the 13th position and ended in eighth ahead of Maisano, Bacci, Giovesi and Roda. At lap 15 the overtaking worth a victory promoted Lewis to the lead at the San Donato brake. The rythm of the Californian did not seem to be matchable by the Roman that obtained a precious second position ahead of Guerin, Campana, Cheever, Marciello, Jousse, Iaquinta, Maisano and Bacci.